Confessions of an ADD English Teacher: Spring Pin Inspiration Party! Spring is definitely here. I have that tingle in my tummy that makes me want to skip down the sidewalk, take off my shoes to feel grass between my toes and drive with the windows open. Oh Spring Fever, how I love you! In addition to my happy mood, the other indicator that spring has arrived is the images I'm seeing on Pinterest where the food has become fresher and lighter and the crafts are bright with color and full of whimsy. What a great time to do some Pin'Inspiring! First, a lovely recipe from one of my co-hosts. 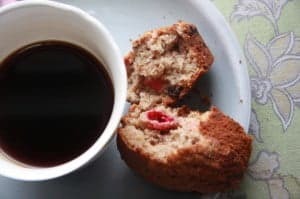 Jane shares this gorgeous recipe for Pink Breakfast Muffins. See, I told you: Bright colors abound! 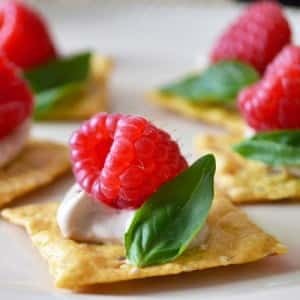 And keeping with those bright colors, I'd like to share my recipe for Raspberry Canapés with Basil and Balsamic. 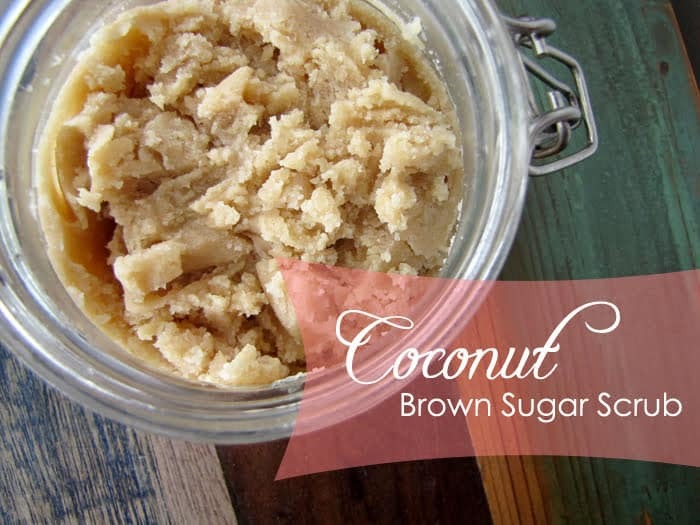 Super pretty and super easy to make! Before I move onto the features from last week's links, I'd also like to let you know that Micki has an Iron Chef Mom Peeps battle going on. If you have a Peeps recipe (or any other marshmallow recipe) to share, head over here to link up. Marshmallows! Yum! And now onto this week's Feverish Features with some fresh and fun recipes and crafts for spring. Looking for a simple spring craft? 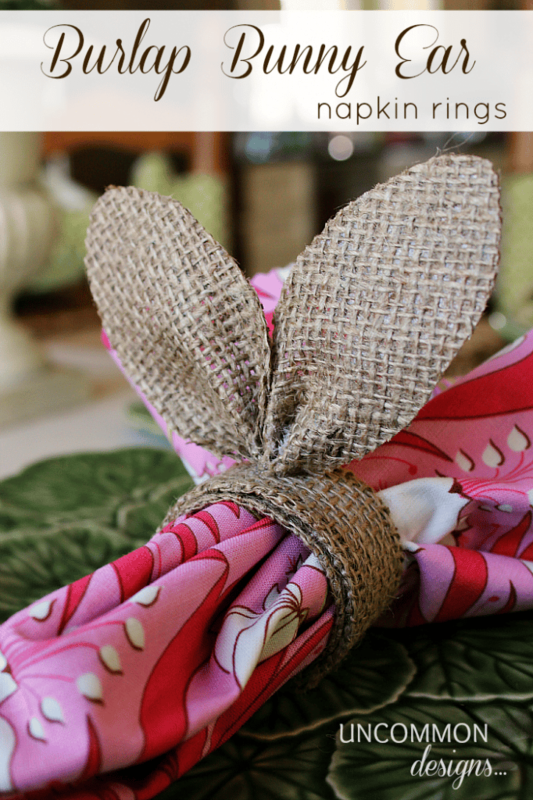 I love how these Burlap Bunny Ear Napkin Rings by Uncommon Designs are so neutral allowing your colorful spring napkins to really shine. Purdy. And finally, it could not be spring without Spring Rolls. I hate to admit it but I have never actually make this kind of soft spring roll before. I've eaten them. Plenty of them! But haven't made them myself. I'm determined to give a try some time soon. I'll share my recipe if it turns out. 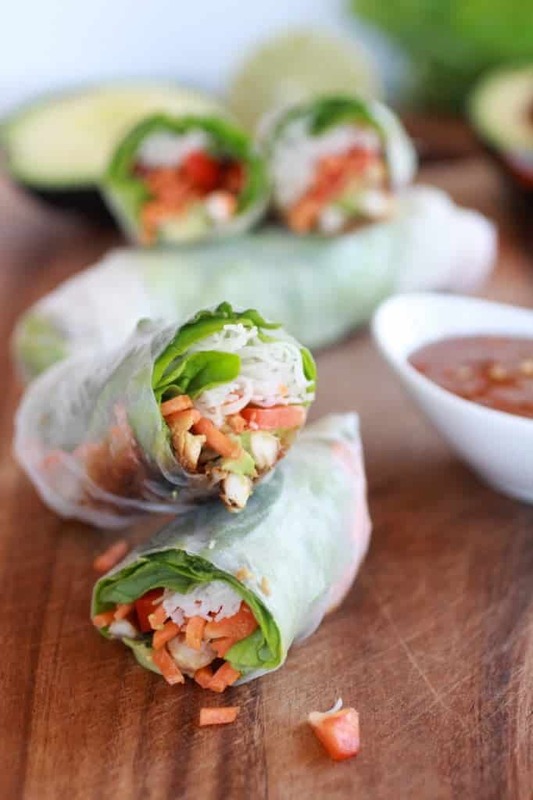 Until then, here's a beautiful version of Fresh Spring Rolls Filled with Vietnamese Chicken and Avocado from Half Baked Harvest. Now, show me how Spring Fever is infecting you. Add your best spring link to the link party below. Welcome to the Spring Fever Link Party! Link up now! Thanks so much for featuring my Avocado and chicken Egg Rolls! Have a great day! Thanks for hosting! Happy Thursday to you!! Thanks for hosting this Spring party, I am glad to be joining in... have a great day!